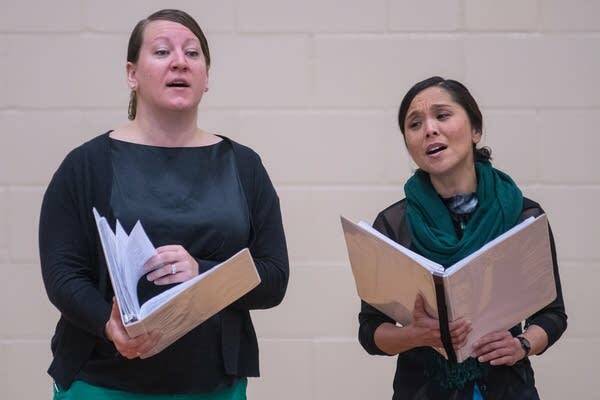 The members of the female vocal ensemble Lumina completed a tour of 11 schools in southwest Minnesota over a week in late October. 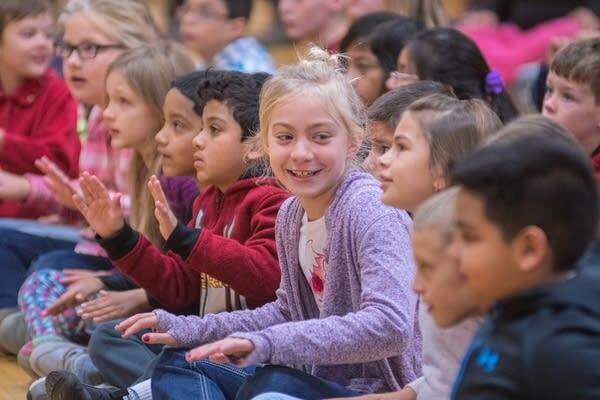 From Montevideo to Worthington to Blue Earth, they introduced almost 2000 students to folk songs in seven languages. 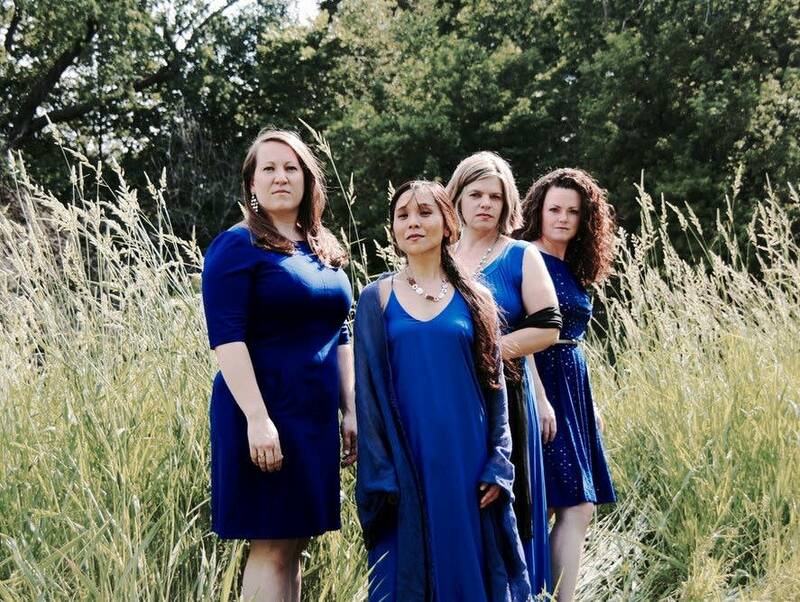 From left, Clara Osowski, Kim Sueoka, Angela Grundstad, Linda Kachelmeier comprise the vocal group Lumina. 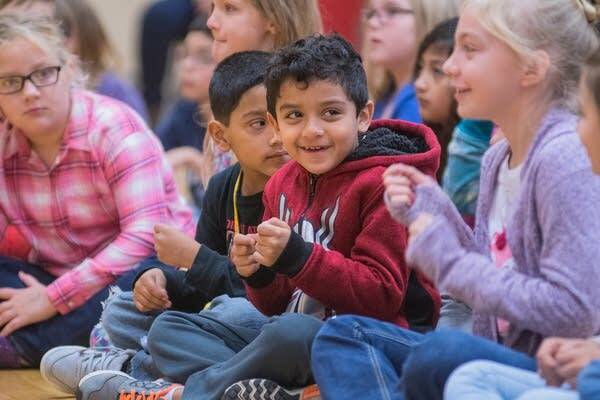 The group performed at Northside Elementary in St. James, Minn., as part of Classical MPR's Class Notes program. 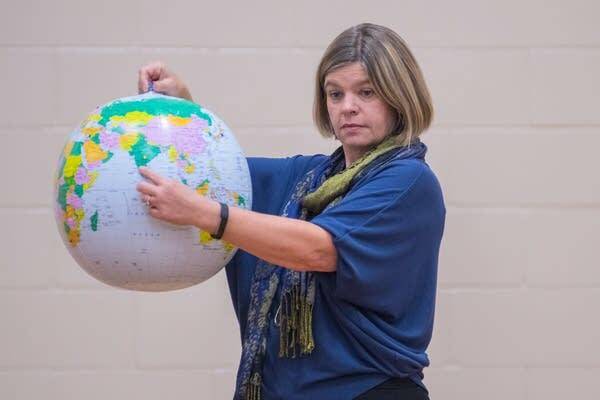 Artistic director and alto Linda Kachelmeier points to India on a globe. 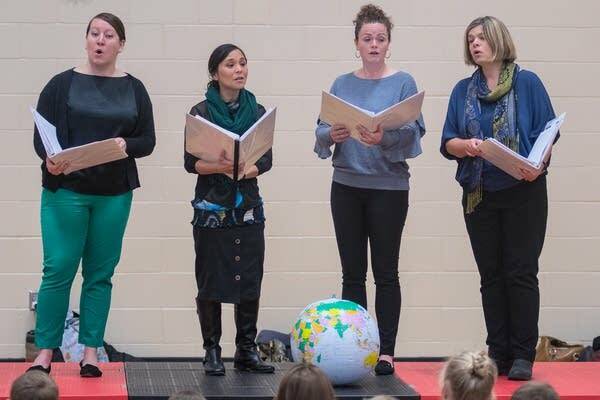 Lumina sang songs from around the world in its performance and used the globe to show where each of the countries were in relation to the United States. 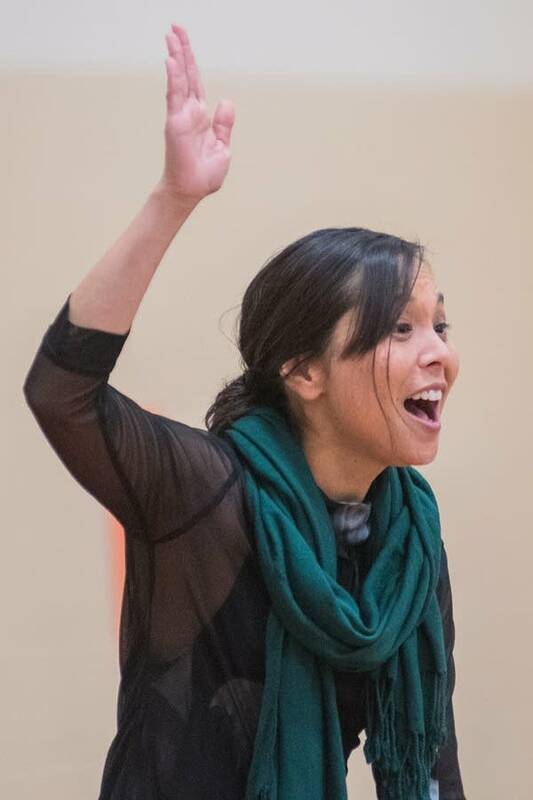 Soprano Kim Sueoka raises her hand to indicate her solo in the Scottish Gaelic waulking song "He Mo Leannan." The students sang along with the chorus. Listen to "Ho Mo Leannan" in the player above. 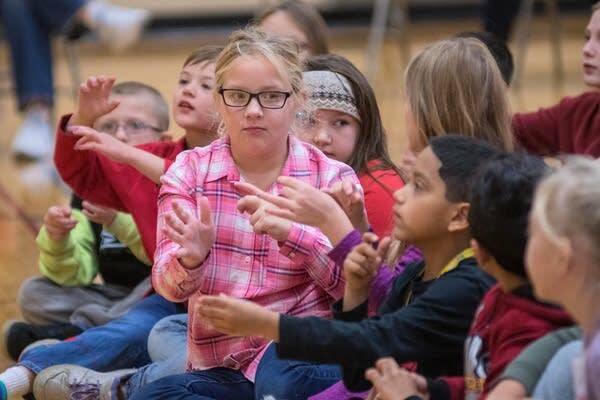 Addison Paulson and her classmates keep the beat and pretend to "waulk" imaginary wool to make it airtight during "He Mo Leannan." Alto Clara Osowski and soprano Kim Sueoka sing the Syrian folk song "Fog Elna Khel," arranged by Lumina artistic director Linda Kachelmeier. This well-known folk song is a melancholy tune that speaks of having to leave home. 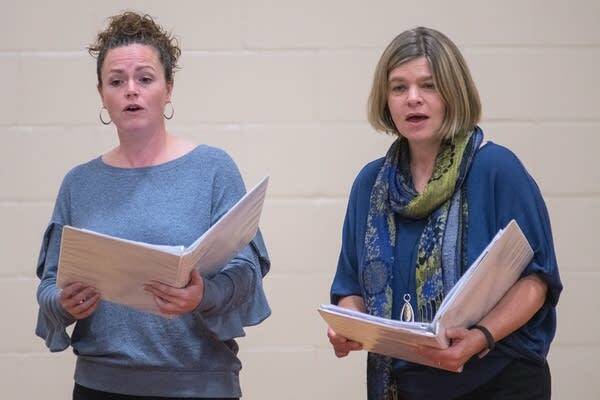 Soprano Angie Grundstad and alto Linda Kachelmeier sing their parts in the round arrangement of "Fog Elna Khel." See if you can hear the round when you listen to "Fog Elna Khel" above. 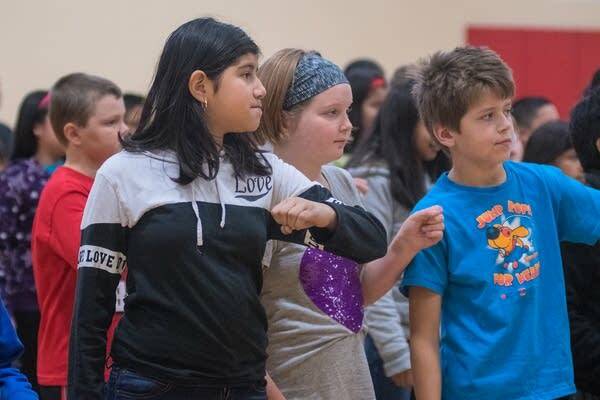 Northside students learn dance moves during Lumina's performance of "Asikatali," a South African freedom song. Listen to "Asikatali" above. 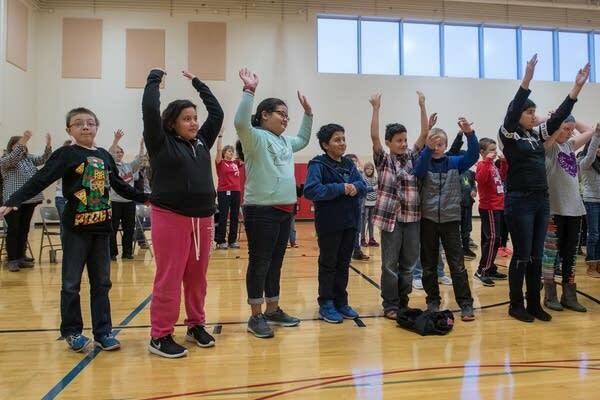 Marely Moran makes a pot-stirring motion as she and her classmates dance along to "Asikatali." Fernando Sanchez Cruz pretends to play a "cuatro" (a four-stringed guitar from Latin America) during "Mata del anima sola," a song about a lonely tree from Venezuela. Soprano Kim Sueoka sings a solo over the rest of Lumina while their voices imitate harp, cuatro and shakers. Mya Hart pretends to pluck strings from a harp during "Mata del anima sola." Lumina divided the audience up into three groups with one group miming harp, one miming cuatro (guitar) and one miming shakers.